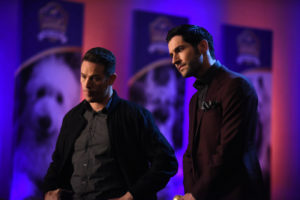 This week’s episode of Lucifer was less inclined to make me yell at my television in anger and frustration at Lucifer and Chloe’s behavior but it was action packed, nonetheless. We are currently dealing with the immediate aftermath of Chloe’s spur of the moment and totally stupid engagement to her lieutenant, Marcus Pierce who – lest we forget – is also Cain of Cain and Abel and until recently was immortal but I digress. Let’s catch you up on what our favorite crime-solving duo are up to. Chloe is at the office with a very giddy Ella, who wants to throw the bachelorette party. We can also see that Chloe is getting overwhelmed with the wedding planning considering she and Pierce decided on a three-week engagement because, “When you know you know, right?” However, Chloe has some unused vacation days and Pierce suggests she use the time for wedding planning and all her cases will be transferred to Dan in the meantime. Lucifer, on the other hand, is in the midst of a booze and silk pajama pity party when he tells Amenadiel the news. I’d like to say that Amenadiel’s face is exactly how I feel about the whole thing and, thankfully, he has the extra resolve to help get those two together. He asks Lucifer what the new plan is and Lucifer has decided his efforts are best spent trying to understand why Chloe would want to marry that “overstuffed man ham” instead of, you know, telling her how he feels like Amenadiel suggests. At least Amenadiel’s words got Lucifer dressed and to the precinct while he comes up with a plan that will actually work. Go team go! Since Chloe is taking some time to figure out all the wedding stuff, all her cases have been transferred to Dan, which means that Lucifer is now working with Dan. It’s definitely a weird partnership, but you have to admire how far they’ve come in terms of their relationship, despite all of Lucifer’s jabs. It’s clear at the crime scene of a dog show (owner dead, dog missing) that the usual spark of crime solving chemistry is missing. Leave it to Lucifer to decide to “be Chloe” and take the lead on the case so he can understand her better, while Dan and the rest of us shake our heads with slight bemusement. Since Lucifer is being Chloe, he’s come to realize he needs someone like himself and Dan will just have to do his best to Lucifer it up. What follows is Dan being shoved into an illegal gambling ring at a bar and managing to swim instead of sink! As the partnership progresses we see a role reversal whereby Lucifer fully embraces Chloe and her typical actions like paying attention to the leads, following the rules, covering his bases and even mimicking empathy. Dan, on the other hand, has become Lucifer’s mirror and projection of his own fears and inaction. The whole thing culminates when the dog, having been found earlier, is returned to the other parent, the dead guy’s husband. Lucifer thinks all is good and sits down to work his way through paperwork and Dan follows a hunch and ends up doing a very classic Lucifer move and lays in wait in the dark for the other husband to get home. We hear a lot of classic Lucifer lines out of Dan’s mouth as Lucifer is realizing the husband lied and was in fact, the killer. After a quick self-congratulatory moment, Lucifer busts in to save Dan just in the nick of time a la, what Chloe usually does for Lucifer. The rant that follows from Lucifer’s mouth is one of self-realization about his own actions (through Dan) and how they’ve affected him as Chloe. He realizes he’s impulsive, unreliable, with no thought of danger or protocol, and so on. While Dan (and we) see the irony, it’s kind of a smack in the face of an “Ah ha!” moment but was much needed for our favorite devil. Ella is all about this bachelorette party planning business but when she sees Chloe so overwhelmed with wedding planning that she’s resulted to a murder board to organize her thought, Ella calls for backup in the form of Maze. Maze is still hell-bent on getting back to Hell, Pierce has just told her that he’s in love and no longer wants to die and he’s actually faking her out about the mark still being on his arm. So Maze’s mission becomes getting Chloe and Pierce happily married so the already gone mark will vanish and they can proceed with the plan. What this actually looks like is Maze hijacking the bachelorette party from Ella instead of just helping with the resulting mess being one of the tamest parties you’ve ever seen with Maze dressed something akin to June Cleaver complete with pearls and a party itinerary full of nail art, meditation, mahjong, and toilet paper dresses. Needless to say Charlotte, Dr. Linda, and Ella are having none of this alcohol-free snoozefest and Charlotte calls a party bus much to Maze’s immense displeasure. The party gets taken up several notches with booze, a stripper pole, fun tee shirts, and even a shirtless water polo team. While Maze is trying to take things back down a few notches (because she wants the wedding to happen), Charlotte is chatting with Chloe and doing her best to sew some seeds of doubt (because she doesn’t). Yes, Charlotte is still working with Amenadiel. The bus reaches critical mass and Ella, who had been trying to keep the drunken peace, yells for everyone but Chloe to get off the bus. When Ella suggests they resolve matters with matching fake tattoos (Pierce tipped her off to a place) Maze storms off, having figured out what Pierce has been up to and the party bus drives off with Chloe where she has her own moment of self-reflection and realizes that this sudden engagement is not at all like her and she hasn’t been herself lately. In fact, she’s not even sure why she said yes and ends up calling the whole thing off. Now while we may be squealing with delight, Pierce is obviously devastated; something more than obvious as he watches Chloe and Lucifer depart to work on another case with things seemingly back to normal. Dan decides to take Lucifer’s advice and tells Charlotte about how he feels. He says he’s all in and they share a lovely kiss. I like this new Dan. Amenadiel takes some advice from Charlotte about getting into Pierce’s head and invites Pierce to Lux to chat now that they are both immortals turned mortal. Amenadiel does some masterful mental warfare about how precious life is and how much time they have left now that they are no longer immortal. Maze is out for blood since Pierce tricked her.